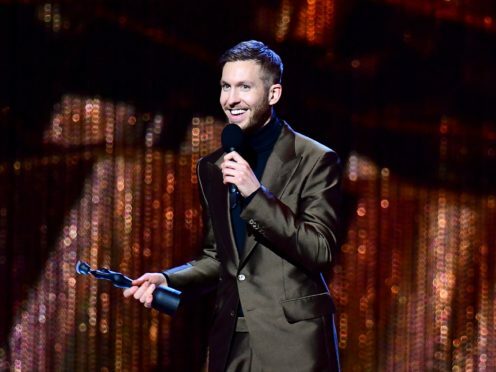 The DJ – fresh off his Brit wins for British producer of the year and British single (One Kiss) – is in pole position with Giant at the midweek stage. The track, featuring Rag ‘n’ Bone Man, is currently 1,600 combined sales ahead of fellow Scot Lewis Capaldi and his breakthrough single Someone You Loved, the Official Charts Company revealed. If the pair hold on to the top two positions on this Friday’s Official Singles Chart, it will mark the first time Scottish acts have concurrently sat at one and two since November 2011. Then, Emeli Sande was on top with her Professor Green collaboration Read All About It, with Harris a step behind, assisting Rihanna on smash hit We Found Love. US superstar Ariana Grande is occupying the third and fourth slots with 7 Rings and Break Up With Your Girlfriend, I’m Bored, while Mabel’s Don’t Call Me Up is currently at five. The most downloaded song across the weekend was Pink’s Walk Me Home, new at number seven on the midweek update. Tom Walker could also be a new top-10 entry come Friday – the Brits Best Breakthrough winner’s latest song Just You And I has risen nine places over the weekend to number 10. Over on the album chart, Grande’s Thank U, Next is battling The Greatest Showman for the top spot. Grande has the lead by just 540 combined sales and is on course for a third consecutive week at the top, with The Greatest Showman at two following Hugh Jackman’s spectacular Brits opening performance. The Greatest Showman’s Motion Picture Cast Recording has spent 28 non-consecutive weeks at the top of the UK albums chart so far, matching The Beatles’ stint with Sgt Pepper’s Lonely Hearts Club Band.